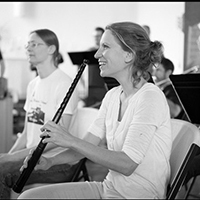 Alexandra Opsahl, recorder, studied with Peter Holtslag and Daniel Bruggen at the Royal Academy of Music. While still a student, she won the 2003 Moeck Solo Recorder Competition. Alex has performed with the Amsterdam Baroque Orchestra under Ton Koopman, the Orchestra of the Age of Enlightenment, Glyndebourne Opera, BEMF, Green Mountain Project, Oslo Opera, Innsbrucker Festwoche, and Fagiolini. She recorded Vivaldi’s Concerto in C Minor, RV 441, with the Norwegian period orchestra Barokkanerne.